RUDE: The Podcast offers a new perspective on hot topics from youth of colour. The team behind RUDE: The Podcast. In RUDE: The Podcast, there's a clip where Snoop Dogg reveals exactly what he would say to black and Indigenous youth who have been criminalized for cannabis-related reasons. The sound bite perfectly encapsulates what the podcast is all about: discussions for activists, by activists. 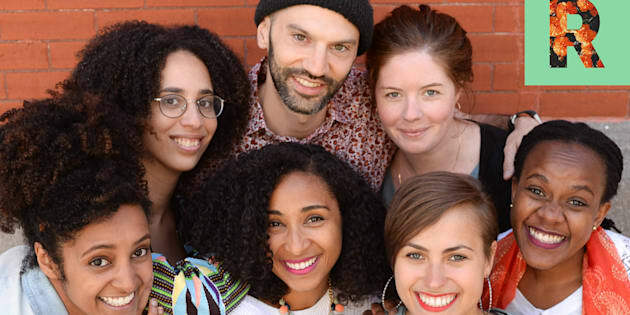 The four co-hosts are: Daniella Barreto, a B.C.-based photographer and racial justice advocate; Barbara Karuana, a Kenyan feminist filmmaker and storyteller; Michael Lipset, a PhD candidate and former rapper, and Emilie Nicolas, an anti-racism activist and founder of Québec Inclusif. They met as fellows of Montreal's Jeanne Sauvé Foundation and RUDE was their final project. The show's name reveals its target audience: millennials who have been called "rude" for pushing back against the status quo and for being social justice advocates. By reclaiming a word that is often used to derail hard questions, the showrunners hope that they can create space to have a conversation with people who share similar values. RUDE's first season has four full episodes and two "Clapback" features, including the one with Snoop Dogg, where they discuss weed legalization, queer labels, cybersecurity, and the complications of allyship. HuffPost Canada caught up with co-host Daniella Barreto and producer Kara Sheppard-Jones to find out more. Sheppard-Jones: [What] makes us different is that we are based in Canada and a lot of the podcast content coming out on social justice issues are coming out of the U.S. One of our intentions was specifically to highlight the Canadian angle and to make sure the conversation doesn't just steer towards talking about the U.S. and talking about [American] issues and movements and organizing because we feel like there's a gap in terms of creating Canadian content for people. Barreto: There are three black women as co-hosts, and Michael. There is so much diversity within blackness and that's something that's often overlooked, where it's like "Oh, this is a black TV show, or this is a black XYZ." But the diversity within blackness is so important because Emilie is from Québec, is black, has been working on racial justice issues in Québec for quite a long time. I have a very different perspective on things than she does, having grown up in B.C. and also being queer and an immigrant. Then Barbara being brand new from Kenya — just here for the 10 months we were living together — also [has] a completely different perspective on certain things. I think that was really cool to bring us all together and explore a little bit like, "Hey, not all black people are the same!" Co-host Daniella Barreto recording an episode for the podcast. You're all about having "conversations that matter." What are those conversations? Barreto: Issues that maybe polarize people a bit are the issues we'd like to touch on, especially in Canada. A lot of us were involved in smaller groups — speaking for myself, around the Black Lives Matter scene in Vancouver. We were having these conversations about "Hey cannabis is being legalized, what does that mean for people who look like us?" Things like cybersecurity, and what that means for the future of activism. People are talking about surveillance and AI and how cool it is, but there are other issues around marginalized groups [since] we've already been surveilled for so long. What does it mean when you add different layers and advances and capabilities to that? What do you want listeners to take away from RUDE? Barreto: We wanted people to leave with a sense of community and to help people feel less alone in this kind of world. It can feel quite daunting to often be the only person with the tough question. We really wanted people to leave with a sense of feeling rejuvenated and refreshed, and like, "Okay, there are other people going through similar thought processes and similar questions and I'm not the odd one out, there actually is a mass of people who care about this." Listen to RUDE: The Podcast on iTunes or Soundcloud.